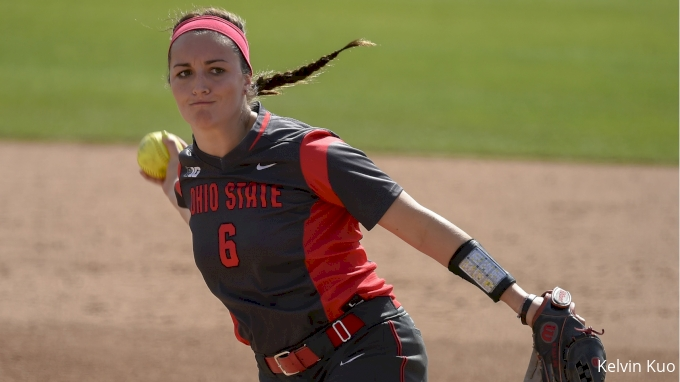 COLUMBUS, Ohio – For the first time since the 2015 season, the Ohio State softball team swept its series with No. 22/20 Indiana behind a 2-0 shutout Sunday afternoon at Buckeye Field. The Buckeyes improve to 3-0 in Big Ten play and 18-9 overall while the Hoosiers drop to 0-3 in conference contests and 25-9 on the season. Kaitlyn Coffman led the team with two hits and one RBI. Emily Clark registered a run, RBI and ninth double of the season. The Buckeyes turned four double plays during the series. Ohio State’s three wins this weekend were the first over a ranked opponent this year. The Buckeyes have shut out eight teams. Ohio State is one of four teams in the conference that swept its opening weekend. Claire Nicholson and Lilli Piper have both gotten on base safely in the last six games. Through three conference games, four Buckeyes are batting .375 or better – Coffman, Ashley Prange, Bri Betschel and Piper. Piper leads the team in Big Ten outings with four hits, three runs scored, three RBI and a .625 slugging clip. Right-handed ace Morgan Ray got going in the opening frame, striking out the first and last batters of the half. It took four innings to break the stalemate as the Buckeyes jumped out to a 2-0 lead. Piper drew a four-pitch walk and Clark sent her home on a double down the left field line, advancing to third base on the throw. Coffman went straight up the middle to bring Clark in. The best opportunity for the Hoosiers came in the top of the first and fifth innings as they got runners to third base but the Ohio State defense kept them from scoring. Ray pitched her seventh complete game on the way to win No. 8 of the season. She struck out five Hoosiers and gave up just two hits as she held the team without a hit in five of seven innings. Indiana was 0-3 with runners in scoring position and 0-9 with runners on base, batting .091 against the Buckeyes. Ohio State is taking a quick break from conference play for a midweek outing at Kentucky on Wednesday at 5 p.m.